A glossary is empty until you add terms to it. 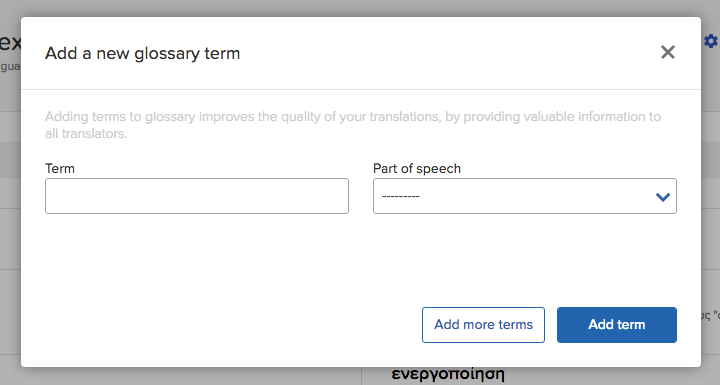 When you add a term, you'll be able to specify its part of speech, add a translation for each project language, and include comments about the term and translations. There are a few ways you can add terms to a glossary from within Transifex. Glossary terms in Transifex are not case sensitive. So if you have the term "approve," it will be highlighted in the Editor whether it shows up as "approve" or "Approve" or "APPROVE" in the source string. Head to your Organization Settings from the main navigation. On the left menu, click on Glossary. Find the glossary you'd like to add a term to and click on the View glossary icon . Click the Add term button near the top right corner. In the popup, type the term you'd like to add to the glossary, select a part of speech, then hit Add term. 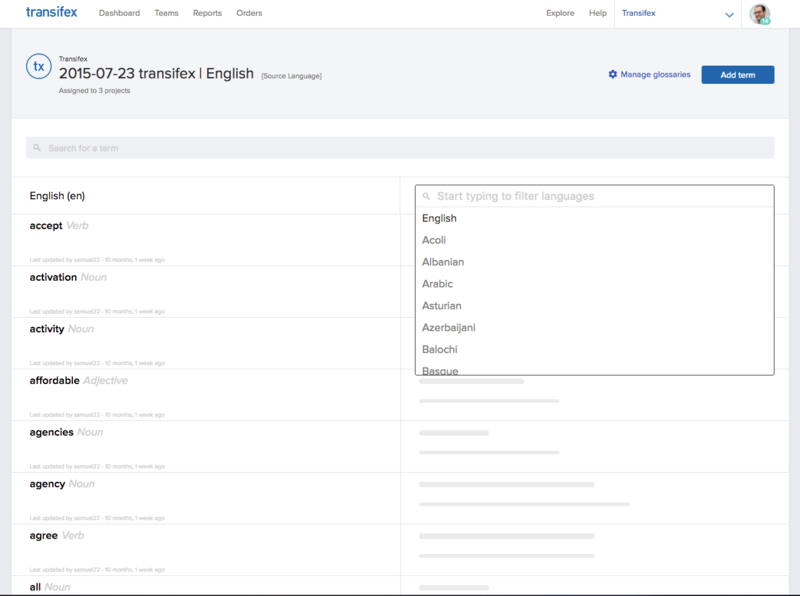 Back in the glossary, select the target language you want to add the translation for. Look for the term you added earlier. Then on the right side, click on Add a translation. Add the translation for that term, then click Save. From within the Editor, navigate to the Glossary tab. Type in the term you'd like to add to the glossary, select a part of speech, and the translation for the term. Including a translation is optional. Click Add term to add the term to the glossary. The term will be added to the glossary associated with the selected project. Head inside the glossary you want to edit. From the language dropdown, select the language you want to edit. Either search for the term or pick from the list. Under the term, click on Click to add a note. Add your note, then hit Save. 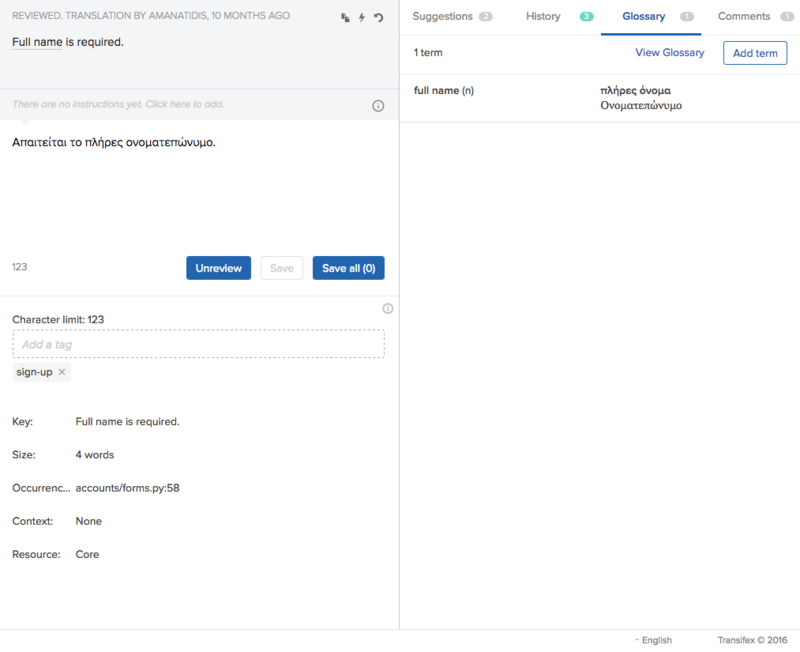 Besides directly adding terms to a glossary from inside the platform, Transifex also lets you upload a pre-existing glossary. This is handy when you have a pre-existing glossary, or you have many terms and you want to create it offline before adding it to Transifex. Who can add terms to a glossary? Anyone involved with a project can add terms and definitions to a glossary from within Transifex. However, only Organization Admins can upload glossaries.